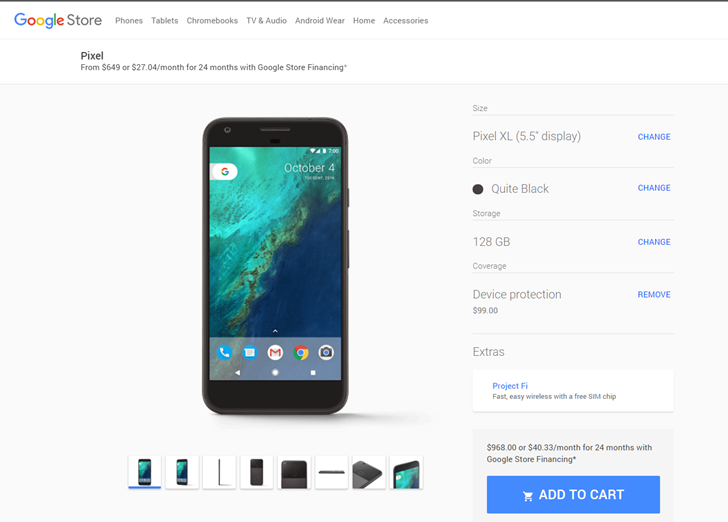 Those financing options are available on all devices and colors, and they don't require a subscription to Google Fi or any other wireless service, though Fi can be purchased at the same time. Device protection, previously called "Nexus Protect" but now somewhat more generic, is also available. That will cost $99 for either the Pixel or Pixel XL, and can be added to an order and spread out over financing too. Pre-ordering will get customers a free Daydream View headset (a $79 value) when it releases in November. The Pixel phones will also be available directly from Verizon, probably at the same full prices, but presumably with Verizon-specific financing options. This is some seriously expensive hardware, and the general nature of consumer tech means it's probably going to be even more expensive in other countries. The phones are available for pre-order in the US today, shipping on October 20th.